I have a definite love of desserts and I’m usually very fond of my cupcakes, but I especially love Autumn Desserts. I love the sweet flavors of apple, cinnamon and pumpkin mixed together, but I especially love the fragrant smells that fill the kitchen while they bake. Nothing quite beats the aromatic smell, but the gorgeous colors definitely help. It’s as if we take the fall foliage and bring it right into our kitchens and onto our tables. Thanks so much, Jenny, for sharing my pumpkin collection! Thanks for sharing my apple cinnamon sugar cookie bars Jenny! 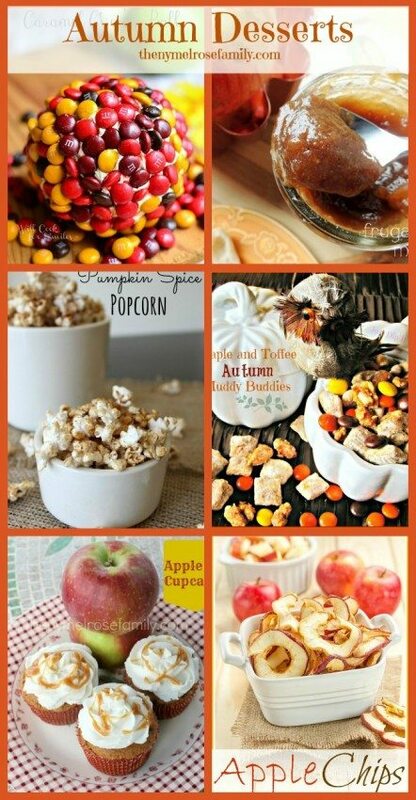 I’m so excited for fall, I’m ready to try out all these new recipe ideas! Thank you for including my M&M cheese ball, Jenny! This is such a great collection! Thanks for sharing my Peanut Butter Banana Trail Mix! I’m so ready for fall desserts! What a great round up, Jenny!! Thank You Jenny for sharing my Muddy Buddies, so sweet of you! I am SO very ready for fall!! These looks SO tasty! Just pinned.